Get a 3-Certified Pro-Movers and a MOVING TRUCK with blankets, dollies and shrink-wraps for 3-hrs Moving and Travel time from/to our office. NEED MORE TIME? It's only $19.99 per extra 15 minutes increments, plus 99 cents per mile for fuel surcharges for the truck. Plus add 99 cents per mile for fuel surcharges. 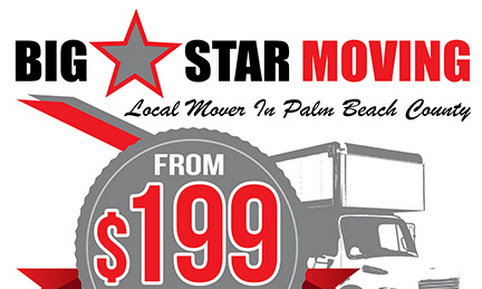 Big Star is a professional small moving company fully insured, licensed and listed on BBB with (A) rating. We specialize in providing Affordable Quick Moving Services for small easy local moves ready to go. Since 2001, Big Star are based in Our office is located at 1499 Forest Hill Blvd In West Palm beach, FL 33406. Since 2001 we have moved well over 9000 Customers. DISCLOSURE: This special moving is regular basic household Furnitures and Boxes! 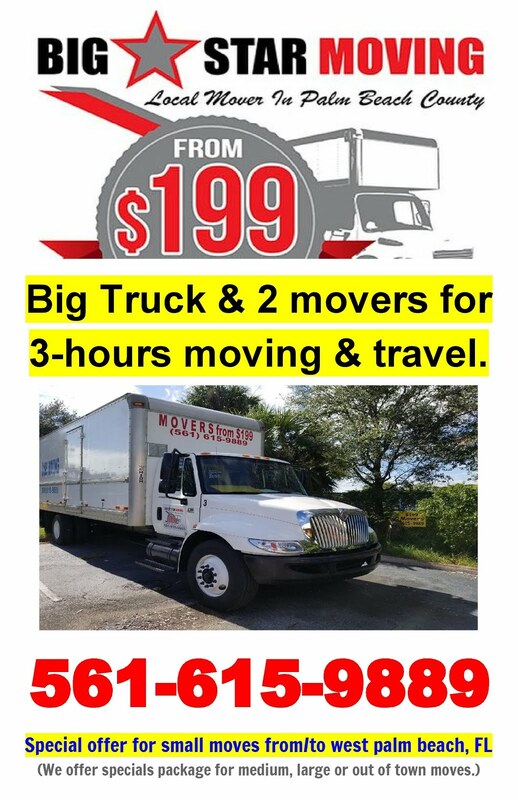 For more information and details, Call 561-615-9889.- We also have special MOVING DEALS for Jupiter, palm beach Gardens, Royal Pam beach, Welington, Lake Worth, Boynton Beach, Delray, Boca Raton, Broward, Miami and Port St Lucie.